On a mission to save orangutans and their forest habitats. Human need for more and more arable land is creating problems of basic survival for many wildlife species, but perhaps none more than the venerable “person of the forest”—the orangutan. These great apes are victims of the clearing of their rainforest habitats for forestry goods, agriculture, and in order to fulfill the ever-growing demand for cheap palm oil, an additive in an array of consumer products. The main goal of the Gunung Palung Orangutan Conservation Program (GPOCP), directed and established by Dr. Cheryl Knott of Boston University 20 years ago, is to work with the communities surrounding Borneo’s Gunung Palung National Park to foster sustainable stewardship of the area’s natural resources and build a future where orangutans and other wildlife can thrive alongside local villages. GPOCP’s primary mission is to conserve orangutan populations and forest habitat. Recognizing that most threats to orangutan survival are human induced, GPOCP strives to develop a human community that is aware and motivated to conserve and protect the orangutans, their habitat and the biodiversity within this rainforest. Since its inception, GPOCP has evolved into a landscape level conservation organization, working towards the protection of the park and surrounding ecological areas as a whole, using the orangutan as a flagship species. The approach consists of four main strategies: Forest Protection; Monitoring, Investigation and Human-Wildlife Conflict Mitigation; Sustainable, Alternative Livelihoods; and Conservation Awareness. IS PALM OIL IN YOUR CUPBOARD? The central area of GPOCP’s work has been identified as a United Nations Great Ape Survival Project conservation priority area. Of the seven main threats to Indonesian orangutan survival as declared by the Indonesian Orangutan National Action Plan 2007-2017, GPOCP works to directly mitigate five in the Gunung Palung Biodiversity Landscape Areas. Those five threats are: human population pressure, changes in land use patterns, poor law enforcement, deforestation, and poaching/illegal trafficking. GPOCP protects forest areas surrounding Gunung Palung National Park through the Customary Forest Program, assisting communities in obtaining a legal decree for the right of ownership and community management over their traditional community lands. By securing these rights the areas are protected from sale to oil palm plantations, preserving the rainforest habitat and precious natural assets. The only great ape species in Asia, orangutans have long stirred the imagination of people in the West. Unlike other great ape species, orangutans are rather solitary primates, living a primarily arboreal life in search of figs, flowers and other vegetation. The load-bearing limits of rainforest tops, combined with the scarcity of fruit, keep orangutans from living in large social groups. Human-orangutan conflict and illegal killing and trade now pose a significant threat to orangutan survival. Wild populations of orangutans have severely declined across Borneo and Sumatra over the last few decades, with the danger of imminent extinction in the wild very real (IUCN 2012). In just 20 years, logging and rainforest conversion to plantations and agriculture have contributed to the destruction of more than 80% of the orangutan’s rainforest habitat. The past decade has seen an estimated 30-50% decline in orangutan numbers, and the remaining wild population is confined to scattered patches on the islands of Borneo and Sumatra. Woodland Park Zoo has long been involved in orangutan conservation. 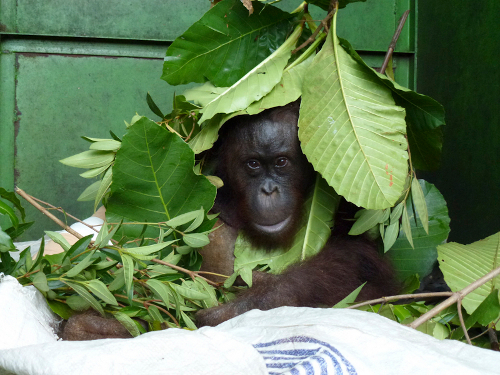 In 1998, devastating fires engulfed Indonesia’s tropical forest, leaving orangutans homeless, many of them orphaned. WPZ staff traveled to the field to provide direct help, taking medical supplies, diapers and baby formula. Zookeeper Andy Antilla assisted at the Wanariset Orangutan Rehabilitation Center in Borneo to help young orangutans develop the skills they would need in order to be re-released into and survive in the forest.